We’ve all been there: you set out to execute a flawless style, you have the perfect combination of products and the best tools, you make preparations regarding how much drying time you’ll need, etc., and yet- the style just doesn’t turn out right. Other times, your hair seems like it just wants to behave badly and the scissors start to look pretty good. Exasperation with the state of your hair may mean change could be good or even imminent. Let’s face it- as awesome as it is to be natural, dealing with natural hair can be frustrating, time consuming, and unpredictable at times, especially when you’re in a time crunch or just ready for something different. When you experience a bad hair day, or think you’re ready for a change such as a cut of some sort or maybe a little color, the first thing to do is always assess the situation and go from there. Here are a few solutions that will help you weigh your options! If your hair style turned out poorly in the morning or frizzed up beyond your liking throughout the day, don’t panic before trying to save the style. Times like these, it’s good to have a few styles that are easy to do and will work no matter what. Check out these videos from ItsMyRayeRaye and Traeh who showcase styles for long and short hair, respectively. Depending on the situation, if a style isn’t going well, your ends may have something to do with it. Dry, split ends can have a terrible effect on any style where your ends are out, so in many cases, just getting a much needed trim may do the trick. If you lead a busy life where styling your hair often isn’t always the most convenient option or if you simply feel as though you want something different, try a protective style. 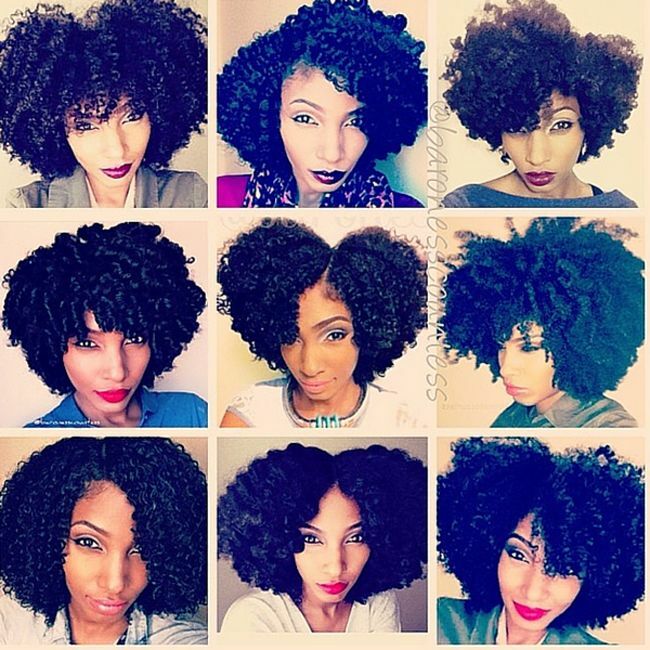 Wigs, braids, twists, crochet braids, and even updos are all terrific options for protective styles and the best part is, you can wear the style you’ve always wanted without embarking on a permanent commitment. There’s certainly nothing wrong with coloring your hair, getting a side shave, an undercut, or cutting bangs or layers into your hair if that’s your preference. Just make sure that your decision is based on a true desire for this change, not just because it seems like a good alternative to your current hair situation. You don’t want to end up regretting an irreversible hair decision. Also, do your research: check out other ladies on Instagram and YouTube who have chosen the hairstyle you are itching to pursue. You can also try to compare hair textures to see how the style will behave on your own hair. If you feel any degree of hesitation then don’t rush the decision and make sure you find a stylist you trust or is highly recommended. 5. Big chop #2,3, 4? A second big chop is always an option, and it could be for different reasons: the fact that you enjoy short hair, miss having shorter length, want to get rid of damage, or otherwise. Keep in mind that a second big chop doesn’t necessarily mean cutting it all the way off. Two years ago, my hair started to become damaged after months of overusing heat. After a year of growing it out, I decided I couldn’t hold on to those scraggly ends any longer and I cut my hair back to shoulder length (it has now grown to arm pit length). I didn’t want to let go of my “length” but having see through ends was simply not the business. If you are considering another big chop, keep in mind that it may not be for the same reasons as you did the first big chop and that’s okay. Just be sure it’s the right decision for you. What do you do when your hair isn’t acting right? Let us know! This article was written by Kanisha Parks of BlackNaps.org for CurlyNikki.